Poll most business owners, presidents of companies, or C-level executives about who are there most trusted advisors are and chances are you will get the same answers: their spouse, their attorney, and their CPA. As a CPA, who are your most trusted advisors? Do you have an attorney or other professional who you can turn to for ideas or advice to help you expand your knowledge base and bring new ideas to your clients? When determining which attorney to work with as a center of influence, first take a look at your own practice and where your clients may have a specific need. If you work with a large number of business owners, there may be a need for an attorney that has a strong working knowledge of buy-sell agreements, estate planning, or liability. Additionally, if you are a CPA who deals with business clients and their qualified retirement plans, there is a good chance that you will come across a situation that will require an outside opinion, sometimes even a legal opinion, on the operation of the qualified plan. I would argue that it makes more sense to have already vetted and established an relationship with a legal professional before the situation arises that you need to recommend one. Attorneys also can provide you with insights and opinions that can help you guide your clients away from trouble to begin with. Similarly when deciding which advisor to partner with as a center of influence, first take a look at your practice to determine if it would make more sense to partner with a professional that specializes in personal wealth management or qualified plan management. If you find that most of your practice is focused on personal returns and individual tax preparation, then it would make more sense for you to team up with an advisor that also focuses on that form of client service. On the other hand, if your practice is focused on qualified plan audits and business tax preparation, then working with an advisor who also works on qualified plans is the best way to go. The pool of advisors that focuses on qualified plans, such as 401k plans, is much smaller, but our knowledge base of the challenges that our 401(k) clients face can be very valuable. For instance, a qualified plan advisor is integral in changing plan service providers. Although a service provider change may not seemingly have an impact on your ability to conduct an audit, it certainly can when you consider the reports that you need to complete your audit and the vast differences when it comes to the availability of reports on a provider website. 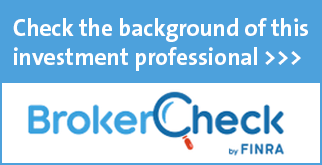 If you have a relationship with that advisor prior to the conversion taking place, you will have a better chance to give your opinion on the new provider that is chosen. In both cases, attorney and advisor, these professionals are more than likely looking to add value to their clients and you as a CPA have an excellent opportunity to do just that. Perhaps you could consider hosting joint lunch and learns, seminars, or webinars that offer content to clients from your unique perspective as a CPA. For example, I recently learned there is a significant difference between a limited scope and full scope audit offered to plans with over 100 employees; I would not have gained this useful information had it not been for my relationship with a trusted CPA partner. Vice versa, I was able to inform this CPA group about the short-comings that we have seen in plan audits and what are clients felt were the most overlooked items in their audits. In both cases, we were able to add value to our own practices while gaining information that we can pass along to our respective clients. People often forget that for the accounting profession, this time of year can be very chaotic. The September and October 15th deadlines create a couple of months of heightened stress. Everyone thinks April 15th ends the long days until New Years but accountants and anyone lives with them knows better. 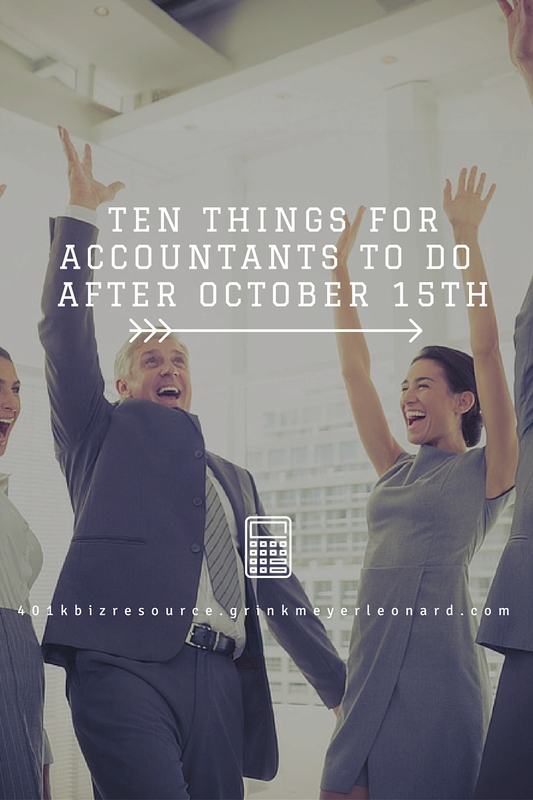 October 16th marks a big sigh of relief from accountants and CPAs (and their families). We want to offer a list of things to do after October 15th to unwind and relax. You deserve it! Catch on up world events. Did you know Apple released the IPhone 6s while you were buried in tax forms this fall? Go to the movies. The newest Hunger Games sequel should be out soon. Aren’t you glad you are an accountant instead of an actuary. Can you imagine how many times people say to them, “May the odds be ever in your favor.”? Dine out. Red Lobster is offering endless shrimp for a limited time only. Better hurry. Watch the tube. Now would be a perfect time to watch those Presidential debates that you DVRed. If you haven’t grinned in a while, The Donald ought to elicit some stress-relieveing laughs. The hair alone is worth a good chuckle. Start your Christmas shopping. Only 70 days until Christmas. Wait, scratch that as relaxing – THERE ARE ONLY 70 DAYS UNTIL CHRISTMAS! Perhaps you should grab a glass of wine (or 2) and start cruising Amazon to get that shopping started. Spend some time with your spouse/significant other. In case you are unsure, it is that person that sleeps on the other side of the bed from you. Visit with friends over coffee. You probably haven’t heard but Starbucks has their Pumpkin Spice Lattes back on the menu. Play with your kids. Remember those cute little humans running around your house that you’ve been “shhhhhing” the last several months; they are in fact fun to play with. And they’ve missed you. Throw a party! Have fun. You deserve it. You have worked hard, now play hard. Enjoy time with your family and friends. Savor every moment of the holidays with loved ones because…tax season starts up again in January.